In a step aimed at rewarding environmentally-conscious new homeowners, Doha Bank, one of the largest private commercial banks in Qatar, has launched Qatar’s first ‘Green Mortgage’ home loan program. Encouraging customers to go green with their housing options, the exciting offer features discounts on loan fees or interest rates on homes that are certified as energy-efficient. In addition to huge savings on utility costs, the Green Mortgage program offers an interest rate of up to 3.99% and repayment option of up to 20 years, making investments in eco-friendly houses an attractive proposition for new homeowners. Other benefits provided by Doha Bank include zero management and mortgage fees, complimentary property fire insurance for one year, and a free-for-life Visa Infinite or Platinum credit card with the option to receive two additional supplementary cards. 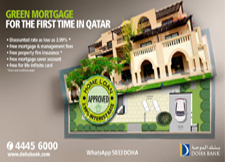 Doha Bank will also provide to its ‘Green Mortgage’ customers an optional free mortgage interest saver account, which comes with additional unique benefits, including the opportunity to earn an interest of 1.25% p.a. on minimum balance held in the account during the month, up to a maximum cap of QAR 2 million deposit.